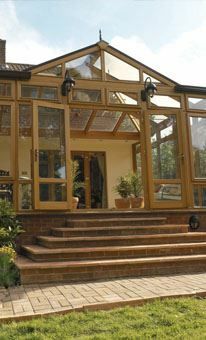 Before any work can be started on the foundations of a conservatory, an understanding of the conservatory ground conditions and subsoil strata on the site is needed. There are several ground conditions that need to be considered and if there is a inspection cover on the site you must also work out how to accommodate sewer pipes. If you are building on a clay soil you will have to know all about the recommendations in British Standard 8004 or if the clay is very soft the phone number of a foundations engineer. Building near trees or shrubs will impact on the design and cost of your foundations. 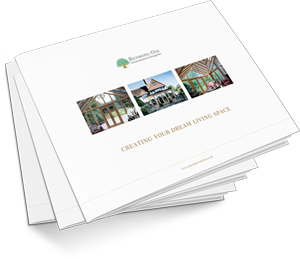 A builder or a foundation engineer will know how to make foundation depth calculations using a foundation calculator and a list of mature tree heights. If you are building on reclaimed land, the existing property will probably be built on substantial footings and your conservatory will also need similar reinforced foundations. Deep strip foundations are the most common type of foundations used in conservatory construction and the cheapest to build when the ground conditions are suitable. Trench fill foundations can be quicker to prepare than deep strip foundations enabling the construction of the conservatory to proceed quickly. Raft foundations can be a suitable alternative if trench fill of deep strip cannot be used. Piled foundations are sometimes used for conservatories where there is no good bearing ground often associated with reclaimed land. Finally, whatever type of foundation and accompanying flooring is specified, floor insulation must be taken into consideration. Is the site is on reclaimed land? Home built after 1939 most often a private sewer system, i.e. one not owned by your local Water Authority. If you are unsure whether your sewer system is private or public you should check with your Water Authority.If the conservatory is being built within three meters of a public sewer, you or your builder have a legal obligation to contact the local water authority and get their approval before building starts.If you cannot avoid building the conservatory over an inspection cover, you will have to replace the existing cover with a sealed, screw down cover to prevent odours and gases escaping into the conservatory.However, if you can, try to move the inspection cover outside the conservatory so that you have good access to potential blocked drains without having to pull up the flooring in the conservatory. If there is an inspection cover on the site of your conservatory it’s a good indication that the foundations for the conservatory will have to be built to accommodate sewer pipes. Here it’s important to ensure that the weight of the foundation does not have the potential to damage the pipe whether this is beneath the foundation or running through it. Clay soils contain very fine mineral particles, silt and sand and can be subject to dramatic changes in volume as their moisture content varies. How much the clay will shrink or expand depends on the ratio of the mineral particles, silt and sand it is made up of. To avoid shrinking and expansion problems it is usual to excavate foundations to a depth where the moisture content of the clay remains stable. British Standard 8004 recommends a minimum depth of one metre for foundations, but if the clay is very soft you may need a foundation specified by an engineer. Foundation excavated in a clay soil should be concreted as soon as possible after being dug. Even left over night the excavations can dry out or get wet, in which case it will need to be dug a further 50 to 100mm. Foundations built over a dried out trench bottom may suffer heave when the clay takes up moisture and swells; if built over a wet trench bottom, the clay may swell which will cause settlement later when it compresses under load. If there are trees or shrubs within 35 metres of your planned conservatory they will impact on the design and cost of your foundations. Clay shrinks or swells according to seasonal changes in weather and the moisture below ground level can be taken up by trees, hedges and shrubs, leading to subsidence in very hot weather. Even if trees and shrubs are being removed as part of the conservatory build or landscaping, deeper foundations may be required as their removal will alter the level of moisture within the soil causing it to swell or shrink. This can also occur when excavations cut tree, shrub and hedge roots. If you are planning new landscaping close to the conservatory, once again you will need to bear in mind how this could remove moisture will be removed from the soil. Whether a new tree is being planted or an existing one is to remain, it’s the mature height of the tree that is used to calculate the foundation depth in an equation using the distance between the centre of the trunk and the nearest face of the foundation. and Willow have high water demands. Chestnut, Plane Pine and Yew are moderate users, while Beech and Holly have smaller water requirements. A builder or a foundation specialist will be able to calculate the foundation depth required using a foundation calculator and a list of mature tree heights. If your home is built on reclaimed land it’s probably built on substantial footings and the new conservatory will need reinforced foundations as well. This is described more fully under the heading Piled Foundations further down the page. Deep strip foundations are the most common type of foundations used in conservatory building and the cheapest to build when the ground conditions are suitable. If the position of the property makes it difficult to get access for machinery, the foundations will have to be dug manually. The width of the foundation depends on the local soil type, but generally the minimum is 450mm. The concrete used in the conservatory foundations should have a minimum depth of 225mm. If speed is of the essence, trench fill foundations can be more quickly finished than deep strip foundations, letting the building of the conservatory to start quickly. You will need to calculate whether the reduced labour time and cost for building trench fill foundations will offset the greater cost of concrete required for them. The trench is filled with concrete exceeding 500mm in depth to a minimum of 150mm below ground level. If ground heave is anticipated, the trench sides may need to be lined with a compressible material together with mesh reinforcement. The trench fill foundation is often specified when soil is loose, in areas with a high water table or heavy clay and if trees are nearby. If trench fill and deep strip foundations cannot be used raft foundations can be an alternative. However, they can pose problems unless steps are taken to ensure that the edge of the raft abutting the existing property will not break away when the raft settles. This problem occurs if there are different settlement rates for the new conservatory and the existing building and manifests itself when a crack opens at the join or in adjacent walls. This is most likely to happen where the substrata is not solid, or when trees are nearby that can affect the foundations. Your architect or builder will be able to calculate the weight of the conservatory and ascertain whether the ground is sufficiently consolidated and capable of supporting the load. Piled foundations are sometimes used for conservatories where good bearing ground can only be found at deep levels such as exist on reclaimed land or where there are subsidence problems. The piles can be dug into the ground although it is more usual to bore them if access for the machinery is available. If there is restricted access, small auger boring machines can be used. These are usually petrol or diesel driven and if noise is likely to be a problem, quieter electrically driven versions are available. The piles support a reinforced concrete ground beam that spans from pile to pile and it is on this that the conservatory is built. No matter what type of foundation is used and what type of flooring is planned, floor insulation must be taken into consideration. This is usually made from 125mm flooring grade polystyrene; laid below the concrete slab or above the slab, but below the screed. If you are installing underfloor heating, floor insulation is essential as it stops the heat from escaping to ground and thus make your heating bills more economical while making the floor more comfortable to walk on. 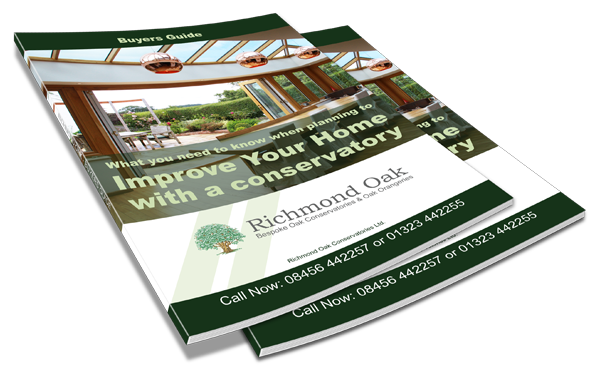 To help you with your buying decision of your bespoke hardwood conservatory or orangery, we have put together the Richmond Oak Buyers Guide. 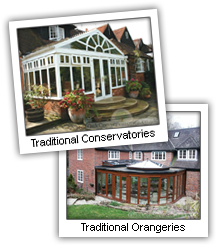 "What you need to know when planning to Improve Your Home with a Conservatory or Orangery".